2.1 "Can we get off? I'm feeling a bit dizzy." 2.2 "That's a tasty single-file line you have there." 2.3 "I've always dreamed of being faster than the camera." 2.4 "I'm worried my youngest chimp won't ever learn to fly." This video explains most things you need to know before starting to speedrun DKC. The most important part is the beginning section on rolling mechanics. Alternatively, you can read the text explanation of rolling mechanics in the section below. After that, you can proceed to learn each stage through the level-by-level guides on the main page. The rest of the video covers specific tricks with a more detailed demonstration than the quick guides below, with tips for consistency and such. "Can we get off? I'm feeling a bit dizzy." Rolling is the meat of this game. It's faster than running or jumping and generally does a better job of dispatching enemies and getting over gaps than the jump alone. To sum up Donkey Kong Country, basically "any time not spent rolling is generally time better spent rolling." DKC speedrunning is primarily based around speeding yourself up through tight maneuvering and tricks to gain speed, so rolling as often as possible and using enemies and the terrain to your advantage is key. As such, knowing enemy placement and how different parts of the stage can affect the Kongs' roll is very important. "That's a tasty single-file line you have there." The most basic and important thing to note is that each enemy you roll through will extend the duration of your roll. A long line of enemies can be used to keep you rolling and let you breeze through an area at a much faster speed than running. Additionally, rolling through any amount of enemies will remove the delay at the end of roll, so you can simply keep moving forward at the end of it. Rolling without going through an enemy will cause Diddy and Donkey to stop in place for a moment at the end of the roll, so normally you need to jump at the end to keep yourself going. Another way to increase the length of a roll is to drop to a lower part of the stage. The distance you travel is always the same on a normal roll; however, if you fall off an edge, you will keep rolling until you hit the ground (you keep speed while in the air), and then the normal roll distance after that. If you time your rolls correctly, you can maintain your speed for a long period of time. This can be used in conjunction with enemies to keep your roll going through large areas of a stage. Certain spots can stop your roll early, however, and falling off a cliff at the very end of a roll will leave you plummeting straight downwards, so you'll have to be accurate and consistent to achieve the same roll through multiple attempts. "I've always dreamed of being faster than the camera." The duration of the roll isn't the only thing you need to focus on. There are a few different ways to gain speed when rolling through enemies. You will accelerate up to a set max speed when rolling through a series of enemies; each enemy will increase this max, up to four. Rolling through a line of enemies not only lets you roll longer; it makes you faster, too. This lies in tandem with another technique: the extended roll. The speed boosts above only apply if you are holding down Y when you roll into the enemy. If you let go of the Y button when you roll into an enemy, you will not gain the speed boost right away. If you press Y again before that same roll ends, however, you will get the speed boost and restart the duration of your roll. For example, if you press Y to roll, go through an enemy with the button released, then repress it a moment later, you will gain speed up to 1408. This does not work if you roll through multiple enemies with the button released, though - so for an optimal extended roll through multiple enemies, you want to hold down Y while rolling through all but the last one. This trick lets us do two things: first, it lets us manipulate when we want to gain speed during a roll. Because rolling only lasts for a short period of time, doing an extended roll will ultimately make you faster, because you get the duration of a full roll with the increased speed on top of the longer roll from rolling through enemies. However, this does not apply if you have to interrupt your roll early - with a jump to reach a platform, for example. In that case, you want to hold down Y so you get your speed boost right away, since you won't be able to keep it for long. Therefore, the extended roll is faster if you have enough room to keep rolling the whole time. Secondly, extended rolls can let the Kongs roll over much wider gaps than usual. If you release Y through a couple of enemies, then repress it right on a ledge (or even after you fall off), you will blast forward with a new roll at a much faster speed and be able to clear large gaps with ease. This is used pretty heavily in DKC, as you will be able to maintain rolls much longer when you don't have to jump across every gap. It also lets you skip some slow-moving obstacles that the game expects you to use, such as ropes and tire platforms. "I'm worried my youngest chimp won't ever learn to fly." The last important rolling mechanic is a glitch called the jumproll (or dankspin, comfy cozy spin, monkey flip, etc.). Essentially, when you execute a roll on the same frame that you land on an enemy, the game bugs out and sends the Kongs flying -- literally. Upon performing the glitch, Diddy and DK spin in the air as if they were just shot out of a barrel cannon. This continues on until you cancel it (by jumping or sometimes rolling), run into a Zinger or touch the ground. It also stops if you run into an object that changes the way your character moves, such as a mine cart or barrel. The jumproll can save massive amounts of time in some stages, but it typically requires an enemy to be near a ledge in order to execute, and is only useful in a few levels. It can also be combined with another glitch, the Super Jump, to create an infinite jump + infinite roll combo. Rolling is the primary form of movement in DKC speedruns, and in most situations, you want to be rolling as much as you possibly can. While rolling, instead of a fixed speed, you accelerate continuously until your roll ends. This effect is increased when rolling through enemies. If you roll through an enemy, you can keep running at the end of your roll. Otherwise, you must jump at the end (ideally as late as possible!) in order to not lose speed. A simple way to improve when you're new is to record your play and look for spots you've been simply running through and try fitting in a roll or two. Try watching the "safe strat" level guides for ideas. Extended rolling lets you increase your roll length and tends to be faster if you hold it the entire time. You can chain multiple "extendos" in a single roll if there are enough enemies. This chaining is the key to optimizing movement throughout the game. 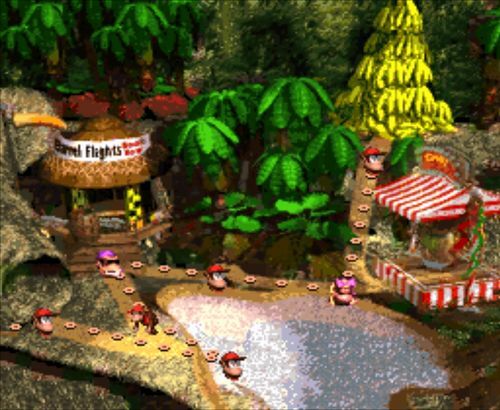 By pressing A, B, X, Y or Start during the Kongs' victory dance on the map, you can end it about 2 seconds earlier. This only works in US versions 1.0 and 1.1. Let go of right until you are well into the level's exit, and then repress once you are past the walking trigger. In realtime runs, this only saves time in mine stages (Stop & Go Station and Misty Mine). When mounting Enguarde, press up and B right before landing on him to get a faster start. This also works with other animal buddies on land. Fall in the direction you want to go instead of straight down. The speed you have when you mount an animal buddy is the speed they start moving at. This trick allow you to pass through enemies with proper timing. Seen in:Coral Capers and Poison Pond. If you jump from a slope while holding a barrel, you can gain a considerable amount of speed and distance. This can be done in a 1-frame window on most edges, but it is easier on the slopes in snow-themed stages. If you run a Kong into Really Gnawty, the World 4 boss, while he's laughing, you can skip his next high-jump cycle. This is used at the end in some categories to skip his longest, four-jump cycle. This glitch is primarily used during the any% bonus warp to further scramble the location of the bonus exit in order to reach World 6. When you throw the DK barrel with only one Kong and exit the stage, you interrupt the Kong's appearance. This will cause a softlock if you get hit at any point, as the game will hang waiting for your other character. However, you can circumvent this by getting hit over a pit, which will put you back over the map screen. After getting damaged and falling into a pit, the game expects your second Kong to be in control. As a result, when you actually do get your second Kong, you will end up in control of both of them. If you jump as you enter a crawlspace, you can stay in the air as you go through it. If you remain crouching after your first jump, you can continue to jump freely. Note that rolling beforehand is not required to perform the trick; it just makes it easier. Seen in: Reptile Rumble, Bouncy Bonanza and Elevator Antics. If you roll while crouching in a crawlspace, you will be pushed out of the wall towards the nearest exit. This is known in most speedruns as a zip. In order to zip to the opposite side, you'll need to make sure you jump as far as possible into the crawlspace before rolling. Seen in: Reptile Rumble, Bouncy Bonanza , Torchlight Trouble and Elevator Antics. When you land on a tire, you can roll off the edge before it makes you bounce. You must be on the edge of the tire for this to work. The easiest way to execute a tire roll is to land directly on the edge and press Y just before you land. Seen in: Bouncy Bonanza, Tree Top Town, Temple Tempest, Rope Bridge Rumble, Oil Drum Alley, Mine Cart Madness, Blackout Basement, Loopy Lights and Platform Perils. To climb above the screen while holding onto a rope, hold down and press B. Repeatedly pressing B will cause you to go higher. Releasing down will cause you to be pushed back into the camera. Seen in: Forest Frenzy and Slipslide Ride. The Super Jump is performed by getting hit near a wall and retrieving the Kong that died, then sacrificing the other Kong and immediately landing on an enemy. When you get hit near a wall, your Kong will infinitely jump up to the sky instead of just running off screen. After this, you must get hit with your other Kong close to where you started. When you get hit with the other Kong, you will automatically jump in the air. If you immediately land on an enemy, you will be able to control the infinite jump. You must hold B while you are landing on the enemy (hidden item mounds also work). You will keep gaining height indefinitely until you release B. You can also hold Y to increase your airspeed. Currently not used in any speedruns, but the superjump is stored until you jump. Not press b, big difference. If you can somehow repress b without jumping (like when you switch kongs) the superjump will still work for you. It is also important to note that the superjump only works things you can bounce off of (i.e. enemies, animal crates, etc. While walking across corners between stages on the map, you can trick the game into making you enter a stage by pressing A, B, X, Y or Start on the same frame you reach the corner. 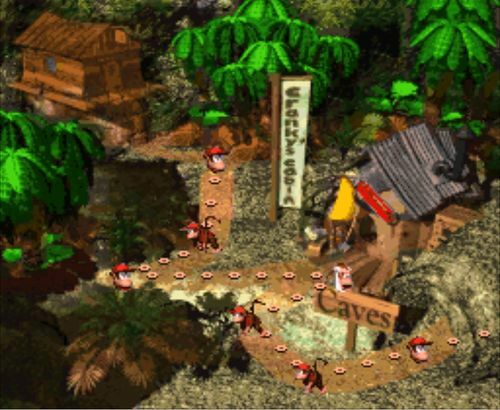 These corners only exist in World 1, and they all send you to Orang-utan Gang, with the exception of the second one, which just sends you back to the second stage. When you reach that corner, your Kong stops in place for one frame. So if you happen to be pressing a button when you reach it, the game thinks you're trying to enter a stage and puts you somewhere. If you have two Kongs on the map, however, this won't work, as the Kong behind you is still moving. To do this trick with two Kongs, you must be in Funky's barrel, so that they are together in the same sprite. As explained in the introduction at the top of the page, the jumproll is an infinite-flying trick that is performed by starting a roll on the same frame that you bounce on an enemy. In order to be able to perform the jumproll, you will need to be in a situation where you can bounce on an enemy while still on the ground. This is usually done when an enemy is right next to a ledge, but can also be done on a tire or while airborne during the Mine Cart Madness mid-air rolling glitch. You will need to press Y on the same frame that you land on the enemy in order to execute the jumproll, and then immediately release it. Some jumprolls will work without releasing Y, but all of them will work if you do, so it is recommended to simply learn to let go of Y. During the jumproll, you are immune to all enemies except for bees. Touching the ground, however, will immediately end the jumproll. Additionally, you can roll out of the jumproll, but only if you see two "explosions" (the red/white bursts that appear when you hit an enemy) when you land the jumproll. Otherwise, you will need to jump out to end the trick. While riding a steel keg past an animal buddy, press and hold B and Y to ride them. Releasing Y will cause the animal buddy to turn into a glitched version of your current Kong. You can immediately repress Y to keep your run speed.